The oldest High Court in India which was established in 1862, Calcutta High Court, has released a recruitment notification seeking candidates for Group D posts . The notification has been released for a total of 221 vacancies. The selection of the candidates will be based on the written examination. The selected candidates can earn up to INR 16,200 with grade pay of INR 1,700 per month. Eligible candidates who meet all the prerequisites set by the government organisation can apply before October 29, 2018. Educational Qualification Must have passed Class – VIII. Graduate candidates are not be eligible to apply. Skills Required Must have knowledge of reading and writing Bengali and English. Visit the ''Recruitment'' under the ''Notifications'' tab. Click on the Group D Recruitment at Calcutta High Court for the online application form. A URL link will be displayed on the pdf page. Clicking on the link will land you on the application page. Preview the application and submit the details. The minimum age limit for the post is 18 years and the maximum age is 40 years as on January 01, 2018. However, age relaxation is provided to SC, ST and pwd candidates belonging to West Bengal only. 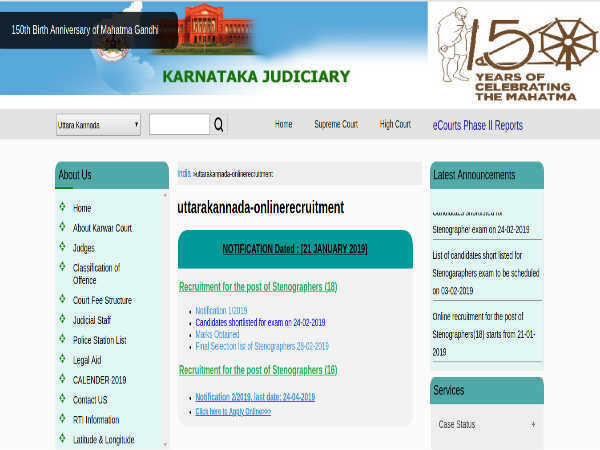 Candidates have to pay INR 400 as the application fee excluding bank charges. However, candidates belonging to SC or ST categories have to pay INR 150 excluding bank charges.